In a hurry? Make this healthy, make ahead side dish for the Thanksgiving holidays. Fresh ingredients like oranges, jalapeño, and toasted pecans make this gluten free pecan and orange cranberry relish a wonderful treat. This recipe makes enough for a crowd, and tastes great on leftover turkey sandwiches. This recipe was originally published on November 3, 2017. Pecan and orange cranberry relish is a side dish that goes fantastic with roast turkey. I started serving this relish on Thanksgiving over a decade ago, and it has been popular at our household ever since. What is cranberry relish used for? Can I make cranberry relish ahead of time? Yes, you certainly can! I encourage you to do so, as it frees up your schedule to make other sides for Thanksgiving or Christmas. You can make it up to three days ahead. Keep it as fresh as possible by storing it in an airtight bowl. Just before serving, add the toasted pecans, orange zest, and fresh mint. First, prep the ingredients. Peel, section, and slice the orange sections. Dice the onion and jalapeño, then chop up the pecans and cranberries. Grate the ginger, and zest an orange. Squeeze a lime and cut fresh mint leaves into ribbons. Toast the pecans in some butter for a few minutes until they smell fragrant. Spread the pecans out on a paper towel to allow them to cool quickly. Dump in the cranberries, navel oranges, jalapeño, red onion, sugar, and grated ginger into a mixing bowl. Pour the freshly squeezed lime juice on top. Stir until well mixed, then cover and chill for one hour, or overnight. Just before serving, add the toasted pecans, orange zest, and mint ribbons. Serve chilled. Garnish with orange zest and freshly chopped mint. Need to reduce the sugar? Cut it back to 1/2 cup. Need a sugar replacement? Use agave nectar or honey. Need to make it ahead? Make this salad up to 3 days ahead. Have leftovers? It tastes great on top of cream cheese bagels or leftover turkey sandwiches. Need to simplify this salad? Leave out the nuts, jalapeños, and ginger. Pecan and orange cranberry relish can be served on Thanksgiving or Christmas instead of a salad. Add this recipe to your holiday menu this year, and you’ll be pleasantly surprised at how refreshing it is! Satisfy your cranberry cravings with these other delicious cranberry recipes. Leftover Turkey Cranberry Brie Sandwich: clean out the fridge with these easy sandwiches. Homemade Cranberry Sauce: this tangy sauce is so much better than canned! You need to try it on a slice of turkey–yummy. 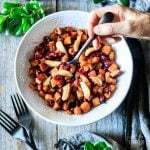 Roasted Sweet Potatoes with Cranberries: this delectable gourmet side dish is super simple to make! Did you make this pecan and orange cranberry relish? Please leave a star rating below to share how you liked it. Pulse the cranberries in a food processor until coarsely chopped. Peel and section the room temperature oranges, making sure to remove most of the pith. Cut each section into 6or 7 bite-sized pieces. Dice the red onion and jalapeño pepper, then grate the ginger and squeeze the lime juice. Toast the pecans in the butter over medium-low heat, stirring constantly until browned (about 3 minutes). Let cool on paper towel. Stir together the cranberries, oranges, red onion, jalapeño, ginger, lime juice, and sugar until well blended. Taste and add more sugar or fresh lime juice as desired. Cover the relish and refrigerate for at least 1 hour and up to 3 days. Just before serving, stir in the pecans along with most of the mint ribbons and orange zest. Garnish with the remaining orange zest and mint. Serve chilled. The beauty of this recipe is it can be made up to three days in advance. Just add the pecans, mint and orange zest just before serving. The white sugar can be reduced to 1/2 cup or replaced with 1/3 cup agave nectar or honey.